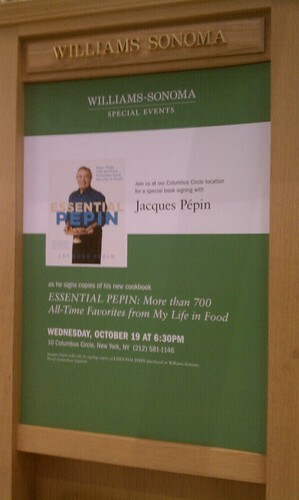 So silly me -- I forgot to bring my DSLR to Chef Jacques Pépin's book signing for his new cookbook, Essential Pépin, at Williams-Sonoma Columbus Circle on Wednesday night. So due to that minor blunder, I had to rely on my mobile's camera instead. My apologies for the blurriness! Since the bean-counting world had me stuck in quite a work-laden jiffy, I asked Marcus if he could head over to Williams-Sonoma right after work so he could wait in line until I could get there. The signing wasn't to begin until 6:30, so I felt that an hour (i.e., from my previous beelining experiences at cookbook signings, of course) was ample time to stand in queue. Marcus, being the best boyfriend I could ask for, said he would go early! He got there around 5:30ish, and forty five minutes later, I was able to make with just enough to pick up my pre-ordered copy of his cookbook and to accompany Marcus in line. Phew! Luckily for me, Marcus got there early enough to be the third person in line -- yay for early queueing! 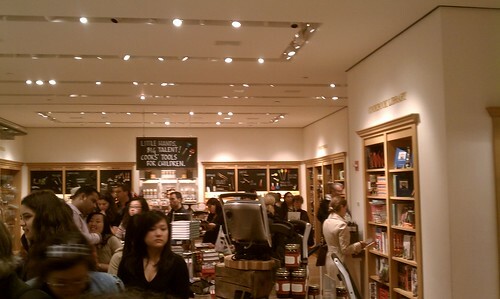 The line started to curve around the store, but thankfully, it wasn't as nearly as mad as the line at the Ferran Adrià cookbook signing. 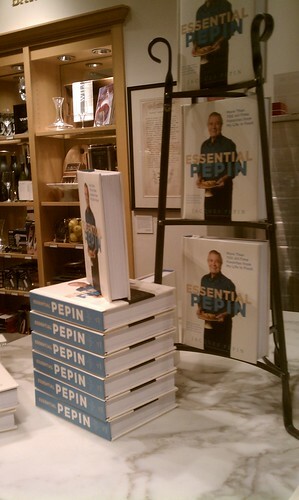 Based on the PBS television series, Essential Pépin, Chef Pépin's new cookbook contains his hand-picked recipes as well as his favorite recipes from his career that has spanned six decades. The book shares and celebrates Chef Pépin's life in food with recipes that find the shortest, surest route to flavor, avoiding complicated techniques. The cookbook isn't focused on just one singular cuisine. In fact, Chef Pépin's cooking spans many styles, which is reflected in Essential Pépin, including "homey country French, haute cuisine, fast food Pépin-style, and fresh contemporary American dishes -- many of the recipes are also globally inspired, from Mexico, across Europe, or the Far East." What makes this cookbook even more awesome is that it comes with a searchable DVD that accompanies it. The DVD's content has Chef Pépin demonstrating all the techniques a cook needs to know. And, in typical Williams-Sonoma book signing fashion, the handy sales associate chefs prepared a sample recipe from the book for the patient individuals waiting in line. 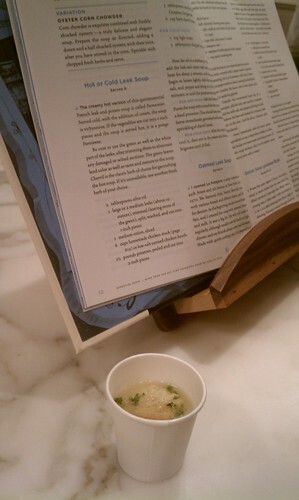 This recipe happens to be the hot potato and leek soup on page 12 of Essential Pépin. It had a light and creamy consistency with puréed potato as the primary base in the soup. Great for the fall weather we're finally getting in the city -- that's for sure! Chef Pépin signing my copy of Essential Pépin. I am always very in awe when I'm around chefs, so much that it often leaves me speechless. 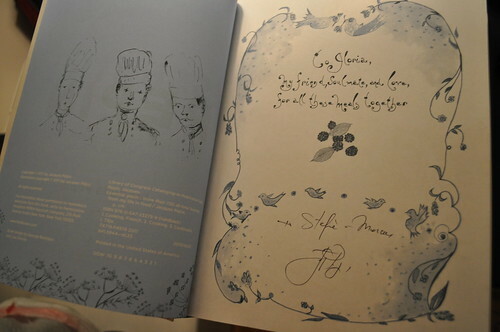 However, Chef Pépin was so friendly, in that cute and endearing grandfatherly way. He smiled at me once it was my turn for my book to be signed, asking me to sit down next to him so we could get a photograph together. 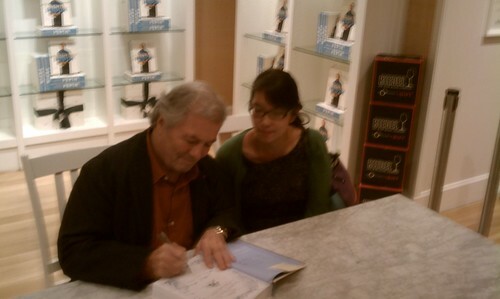 I meekly went over and thanked him for signing my book, only for him to reply with, "No, thank you for coming!" 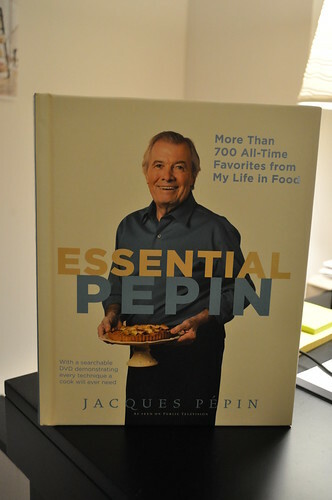 Our copy of Essential Pépin: More than 700 All-Time Favorites from My Life in Food. Also another thing to note is that this is Marcus and I's first cookbook inscription that includes both of our names -- a very exciting day, indeed! Findings: The things I love about the fall season is not only for its beautiful weather but also because it is the season for new cookbook releases, which means an inundation of many a possible cookbook signing to attend and meet some well-renowned chefs. 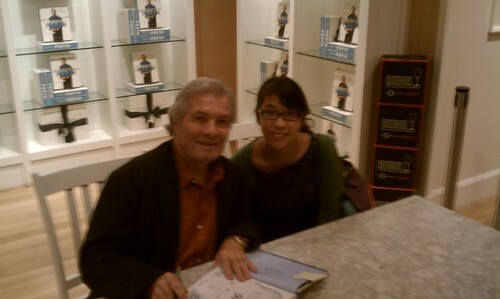 It was such an honor to finally meet Chef Jacques Pépin in person -- he really is as friendly in person as he is on television. I'm excited to start delving into the many recipes in this book as well as check out the contents on the DVD. Upon my initial perusals of this cookbook, it seems that this will be one of those in our kitchen that will be used quite frequently, attributable to its general appeal and simplicity in directions. The soup section is definitely of interest for me, mainly because it is one of the most extensive sections (approximately 30-40 recipes!) I've ever seen in a chef-driven, non-general cookbook. I also like that it is not just a cookbook with recipes, but also has a introductory blurb before each recipe with brief suggestions on what the said recipe goes well with and/or tips on its preparation. So all in all, another great addition to my growing collection of signed cookbooks! Price point: $40 for each book.